The friendly skies may not always feel so friendly. Air travel can be one of the few times where you feel the most vulnerable: You’re 30,000 feet in the air with complete trust in the pilot, the flight attendants, airport security, and your fellow passengers. It’s no surprise that air travelers have a lot on their minds when it comes to safety, security, flight delays, inclement weather, and more. Thankfully, there are a myriad of ways travelers are alleviating their anxieties and finding ways to cope. We surveyed 2,000 air travelers to determine what worries them the most about flying and what they are doing to calm their worries. 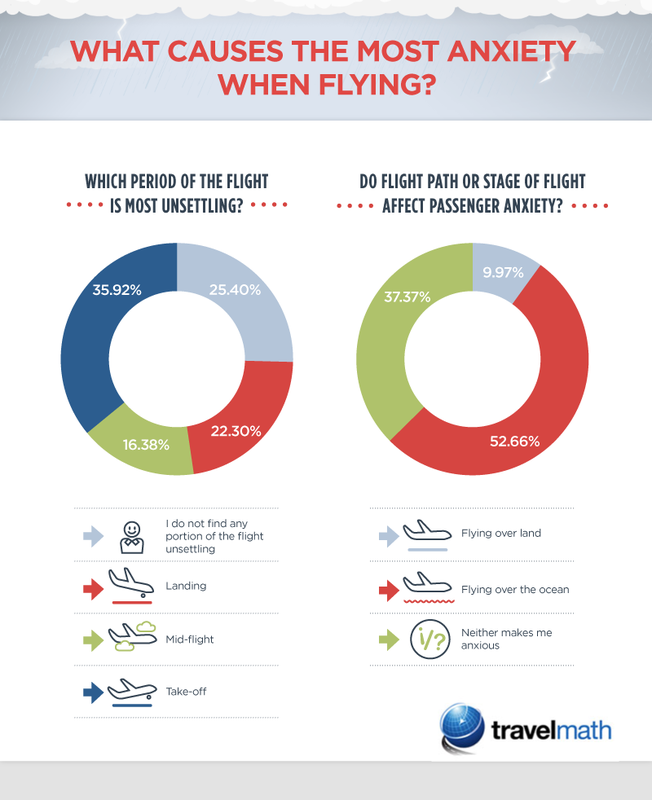 Take a look at the results: What aspect of flying do you find the most stressful? Even if you double- or triple-check your ticket to confirm the right time, terminal, or gate, you may still have other worries on your mind. We found that 85% of travelers worry about their flight being delayed or canceled, which is an inconvenience when it comes to time as well as a potential hit to the wallet. But it doesn’t end there: Bad weather is a concern for nearly three-fourths of travelers, as rain, storms, and snow can often be unpredictable. Other woes that top the list include worrying about traveling internationally (68%) and recent airplane disasters in the news (67%). Surprisingly, one of the least concerning fears was the plane getting hijacked – only 39% of respondents say that is on their mind when traveling. All in all, air travel concerns have 38% of people thinking twice about booking their next flight. On the other end of the spectrum, 3 in 10 travelers report having no anxiety about flying whatsoever. But when it comes to the possibility of needing to remain calm and take charge on a flight during an emergency, the extra legroom isn’t enticing enough for one-third of travelers to opt for an exit row. 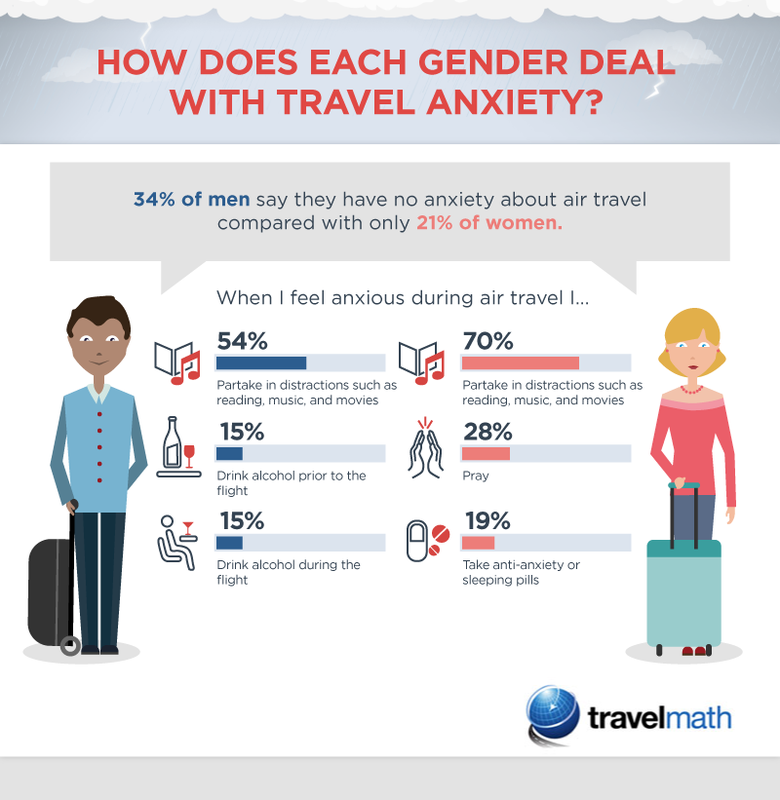 Do men and women deal with travel anxiety differently? To find out, we broke the data down by gender and discovered some interesting distinctions. First, 47% more men than women are not apprehensive about flying at all. When it comes to coping mechanisms used by fearful flyers, women are the more likely gender to calm their nerves with books, praying, or medication, while men are more likely to drink before and during the flight to de-stress. Men and women do have one thing in common when it comes to travel trepidations: They both say activities like reading, listening to music, and watching movies are their go-to distractions on a flight. With 54% of men and 70% of women saying these diversions help them most, it is no wonder why many flights have movies and TV access free of charge for travelers. In 2014, United began offering free video streaming on various aircrafts, and JetBlue recently announced its partnership with Amazon to offer complimentary video streaming to Amazon Prime subscribers over its Fly-Fi broadband Internet. The growing demand for on-board entertainment certainly spans the genders. Here’s an interesting twist: Even though 41% of respondents said they worry about the pilot becoming incapacitated during a flight, 92% trust the pilot overall. 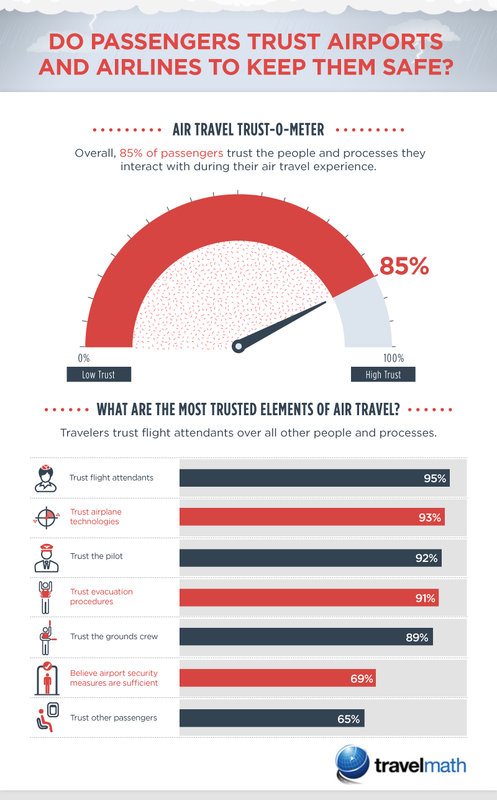 However, flight attendants are the most trusted of all with an astounding 95% of passengers trusting them. While incidents of erratic flight attendants make the news, most people’s experiences with them are positive. Even with all the anxieties and worries, it’s safe to say that most people (85%) trust airlines and airports to keep them safe from harm. Could it be the extensive security measures that many travelers often gripe about that subconsciously instill a sense of protection in travelers? Even though 3 in 10 don’t think airports’ current security procedures and processes are adequate, air travelers are sure to be comforted by the increased security that comes with holiday travel. How do fears shift when you’re in the air? The stage of flight matters greatly in terms of passenger anxiety. Most say that flying over the ocean is scarier than flying over land, with about 4 in 10 saying neither make them nervous. While about a quarter of travelers find no specific portion of a flight unsettling, over 50% of travelers are most anxious during takeoff and landing. The majority of people find mid-flight more relaxing than takeoff or landing. Since only around 20% of passengers are most uneasy during the flight, it’s likely that the distractions mentioned further above are quite powerful de-stressors. Passengers are more likely to zone out during mid-flight too, with food, drinks, conversation, and sleep occupying their time. Air travel anxieties and qualms are eased when flights are pleasurable, non-turbulent, and on-time and when airports and airlines work hard to keep people safe. Most travelers believe they are in good hands as they travel, and they don’t plan to change that anytime soon. If you are anxious when you travel, prepare for the flight by ensuring you have plenty to distract yourself with. And remember, the passenger sitting next to you might be experiencing the same fears as you, so try starting up a conversation to distract you both. We surveyed 2,000 people in the United States to compile the data for these graphics.